Alien Crime Syndicate transmits punchy, crunchy, high-octane power-space-pop with meaningful lyrics that actually say something. Though, they're also broad enough so you can interpret your own meanings from them. On their debut full-length, this Seattle quartet gives the listener plenty of pop know-how to enjoy track after track, listen after listen. The album opens with "Take Me To Your Leader," a fast, driven pop ditty that crunches along with a swift beat and roaring guitars, but adds a quirky, space element to keep things distinctive and fresh. Then there is "What I Said," where frontman Joe Reineke confidently proclaims "That's not what I said/ Cause what I said is what I do." With certainty and energy, the song bulldozes forward, while still maintaining a hook-laden base that will find you, without a doubt, singing along and breathing the music as if it were essential for life. "Outerspace" allows you time to cool down as the band delivers a slow, simmering pop piece. Leaving behind the power-pop, the ACS concentrate on gorgeous space-pop, yet still maintain the driven rhythm section that makes you want to get up and bounce around, as well as the guitar-pop hooks. But, instead of speeding along and making you want to move to the power and speed, they make you sit back and feel the vibrant, colorful sounds they're dishing out, as the intensity burns deep inside you and every note resonates in your head. "I Want It All" pushes ahead with more confidence as Reineke demands it all. Lines like "Really gotta have the most/ Never can be thinking small/ I want it all" gives you the feeling that ACS won't stop until everyone knows who they are, everyone loves them, and they're all over the airwaves. And with songs "Tripping Up To The Clouds," with its spacey drum loops and pensive vocals, and the pop-punk/surf-rock of "Nothing Beats The Surf In", you'll be praying for the day that ACS gets what they want. When that happens, we'll know commercial pop music has come to its senses and started to respect substance and creativity over marketability and cheap frills. "Pimpin' the Land" deserves honorable mentions, too. "It's not about relationships," Reineke stated in a recent interview with me. "It's about the government." A splash of punk charge helps boost this power-pop number into another stratosphere. With lyrics just as catchy as the hooks ("If you can make a living off pimpin' the land/ I know the government could understand"), ACS stuns you with a fiery, unforgettable melody, while freezing you in place with a socially conscious song that doesn't shove its agenda down your throat. Reineke proves you can say and do more with the right hook and a bouncy beat than you can by screaming and projecting your anger at someone. Dust To Dirt, while still early, has already earned its place as one of the top ten releases of the year. 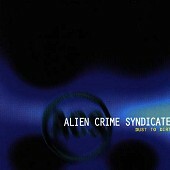 Strong hooks, lyrics you actually want to sing along with, and music you can't help but find yourself craving 24/7, Alien Crime Syndicate are one of the best indie pop bands out there. And if the music world is fair, they're not going to be indie for that much longer. I'll give it an A+.